Home » Our Work » Stories of Children » Meet Manikanta: Our Would-be Engineer! Meet Manikanta: Our Would-be Engineer! Have you ever wondered, how much it takes to walk miles with hope in eyes? We’re sure, we all have our own set of dreams but not everyone is born with enough fortune. It is true that hardships in family can push the children away from their dreams. However, give it a thought, isn’t every child is born special and all they need is little support and encouragement. Today, let us tell you a tale of a child with high hopes. 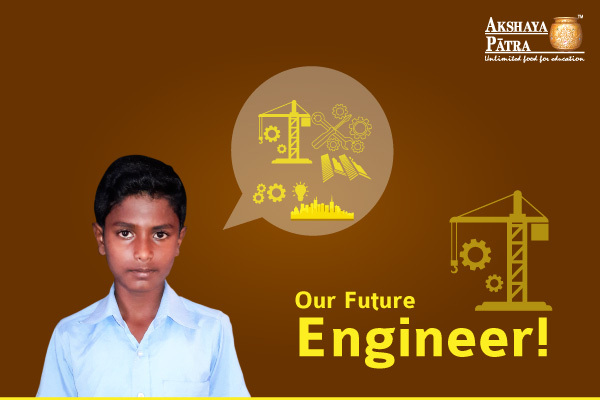 Meet Manikanta, from Doddabettahalli, Karnataka, he is in standard 8 in GHPS school, who aspires to be an engineer. He comes from a family with challenged background, but that doesn’t deter him from pursuing his dream of becoming an engineer. He redefines the whole concept of not letting harsh days defeat his spirit. Children like Manikanta is a perfect example of someone who is marching towards achieving his dreams bearing the wraths of life. The determination in this child’s eyes uncover the zest in their life. The determination to achieve something, the zeal to live a better life. Hailing from a family of 6, Manikanta understands the struggle his parents go through. Both of his parents are labourers and their earning isn’t sufficient enough to support his dream. Amidst of all these hardships, the teachers claim that he is a friendly child and an obedient one. His parents are also pretty enthusiastic about his dream. They believe that he will change their fate and be a ray of hope and joy for the family. Talking about Akshaya Patra’s school lunch served at school, Manikanta says, “I love the pulav served at school. I love Akshaya Patra’s meals as it is hot and tasty.” The child is one among the millions of beneficiaries of our mid-day meal programme. Manikanta symbolizes the story of hundreds of children from these parts of Doddabettahalli, for whom school is the route to better life. The mid-day meal is a source of nutrition for the children that ensure their healthy growth. We at Akshaya Patra, aims at providing nutritious meals to the children with our mid-day meal programme. It is our mission to make sure to feed 5 million children 2020. We hope that you will join our initiative and be a part of this noble cause, every child deserves a fair chance.